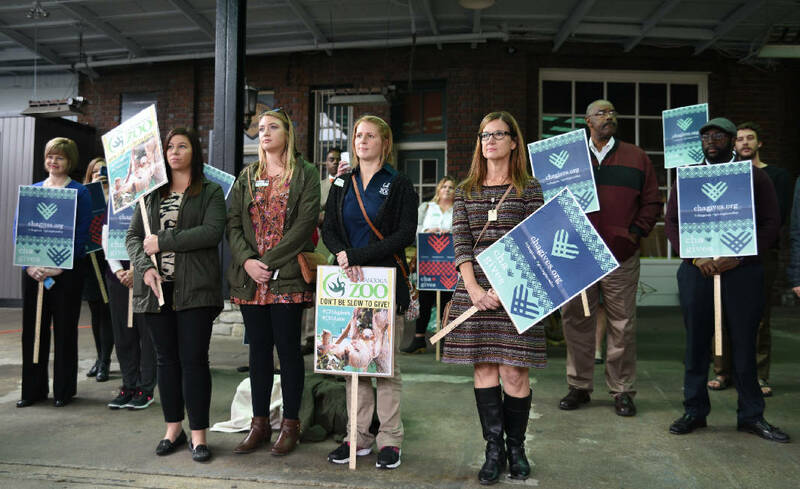 People hold signs during the Cha Gives kickoff announcement Tuesday, Nov. 15, 2016 at the Chattanooga Choo Choo. CHA Gives Day will be Tuesday, November 29, 2016. 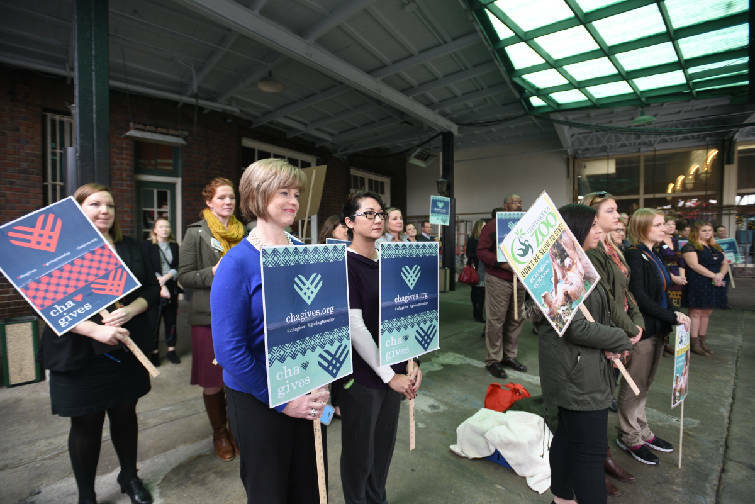 With Black Friday behind it and Cyber Monday in full swing, Chattanooga is gearing up for its own version of #GivingTuesday, a global day dedicated to giving back. Started in 2012 and fueled by the power of social media and collaboration, #GivingTuesday is an international movement aimed at reminding people to give to charity. And four years ago, #CHAgives was formed to localize the campaign in the Chattanooga region. Last year, #CHAgives raised nearly $500,000 — more than double the amount from 2016 — for Chattanooga's nonprofit community in just 24 hours and ranked in the top 15 most generous cities in America, out of more than 110 #GivingTuesday campaigns. The goal for this Tuesday is to raise $750,000 in donations. "The idea behind Giving Tuesday is that we can do more together than we can do alone, so the more nonprofits that get involved every year, the more donors we can reach," said Chelsea Conrad, director of creative engagement for Causeway. "I think that really benefits everyone involved because we're really able to raise more all together." Causeway, a Chattanooga-based nonprofit, is partnering with the United Way of Greater Chattanooga, the Generosity Trust, the Chattanooga Area Chamber of Commerce and the Community Foundation of Greater Chattanooga to promote #CHAgives. And this year, the campaign is being run by a committee of 10 nonprofit leaders who have run successful fundraising campaigns in the past. A pop-up party will take place at Miller Plaza from 10 a.m. to 2 p.m. People can stop by to learn about local organizations and drop off an item from their wish list, pledge volunteer hours and/or write love notes to Chattanooga. Other places to donate can be found online at chagives.org, where a list of 200 participating nonprofit organizations and 400 community partners can be found. Many local restaurants and businesses, which also are listed on the website, will donate a portion of Tuesday's proceeds. The Glass House Collective, a nonprofit organization dedicated to renewing, supporting and celebrating life on Glass Street, is hosting its own fundraiser, called #raiseyourGLASS, during #CHAgives. "We're really asking nonprofits to do stuff like that, kind of self-promotions," Conrad said. "... We'd love to see more of that." The Glass House Collective partnered with a number of local restaurants, and a portion of their sales will go toward Glass House Collective. A list of those restaurants can be found on the #CHAgives website. The Glass House Collective team will be thanking its supporters in person throughout the day. But money isn't the only way to give back. People can donate their time or expertise to local organizations that might need a helping hand. A list of those opportunities can be found online at ihelpchattanooga.org.